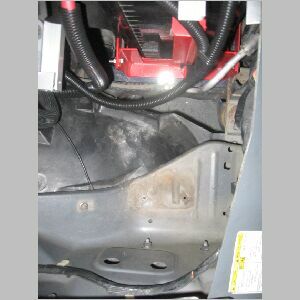 The pump is mounted on a steel shelf on the passenger side fender by the front headlight. 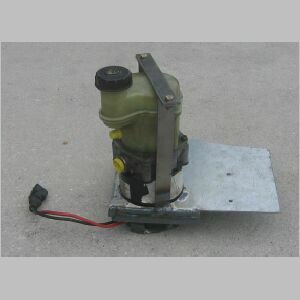 I bought this pump from Ebay seller pontiac442. At the time of this post item number 250370701874. This will expire but may be relisted from time to time. I paid $299.99 + $65.00 shipping. the item comes from Isreal. It arrived quickly and without a problem. The shelf material was obtained at Lowes here in Florida. 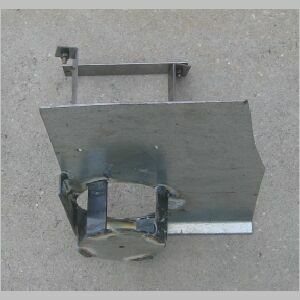 It is a Lateral stabilizer for class 4B soil. 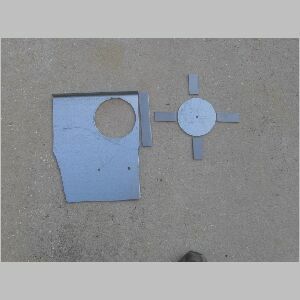 This stabilizer plate is manufactured by Tie Down Eng. This is their model number 59285. It is Lowes item 29225. I paid 5.98 on sale, the regular price was 14.98. I cut a cardboard pattern which started as a rectangle 11 inches by 7 inches. I removed the old shelf and used it for hole alignment. 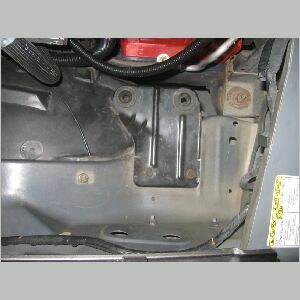 I was able to slide the cardboard under the fender liner on the headlight side of the shelf. This allowed me to mark the curve. I did this twice. Making a deeper cut the second time. 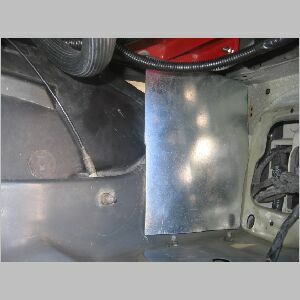 I did a trial fit and marked the under side of the shelf with a pencil along the curve of the fender liner. 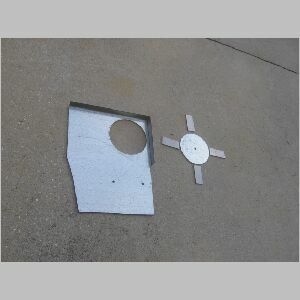 This helps to locate the hole over the open area. You can see the curve if you click on the left image below. Ed Dygert of Brown’s Repair welded the parts together for me after I cut the parts. Now that the pump is mounted, it needs to be put into operation. 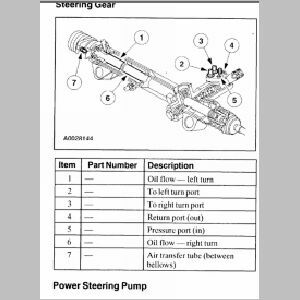 The goal is to have power steering when you need it, but be able to turn it off when you don't. 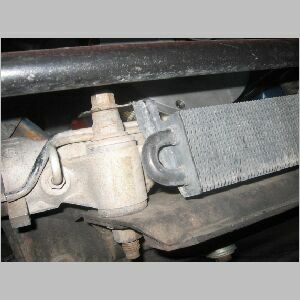 Also the goal is to have reasonable steering control if or when the pump fails. I call it "Fail Safe", part time power steering. To accomplish this, there will be a shunt between the high pressure delivery line and the low pressure return line when the pump is off. Of course there can't be such a hydraulic connection when the pump is on. So the plan is to have a control valve in the shunt line. 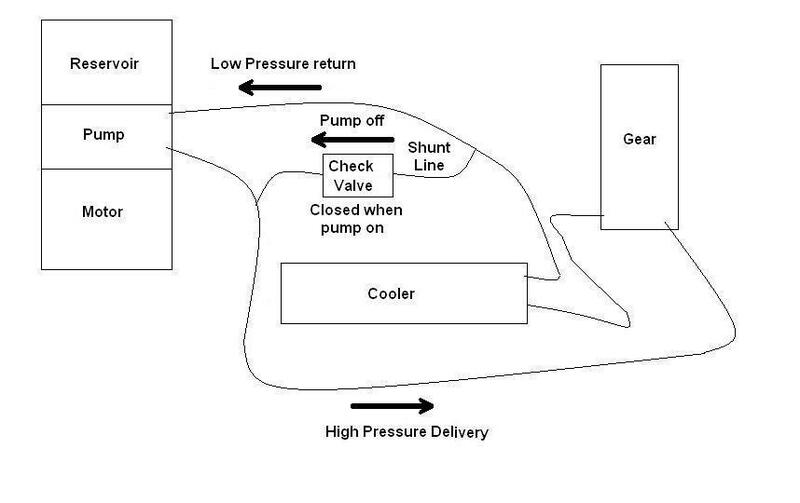 After considering several alternatives involving a solenoid valve, a check vale was settled on, for the shunt line. 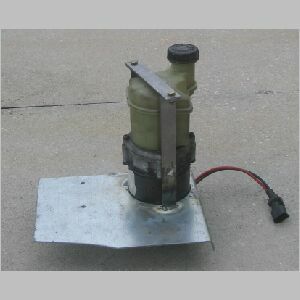 This passive device will close in response to the high pressure produced when the pump comes on. When the pump is off, any attempt to steer will relieve pressure in the high pressure delivery line and produce pressure in the low pressure return line causing the check valve to open. 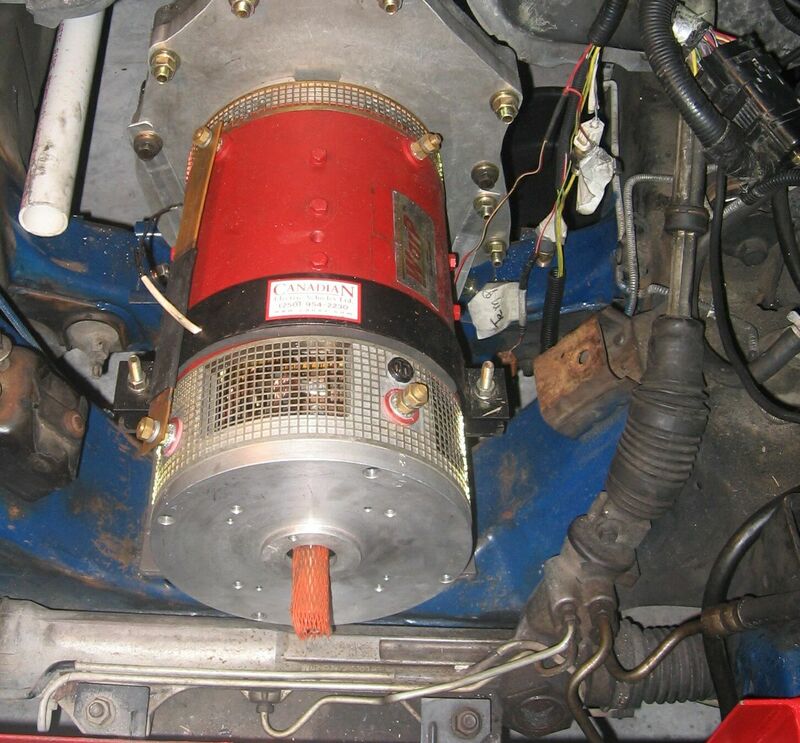 As the driver turns the wheel, the piston is advanced in the cylinder attached to the rack. 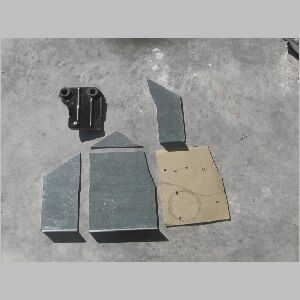 This relieves pressure behind the piston in the high pressure delivery line. 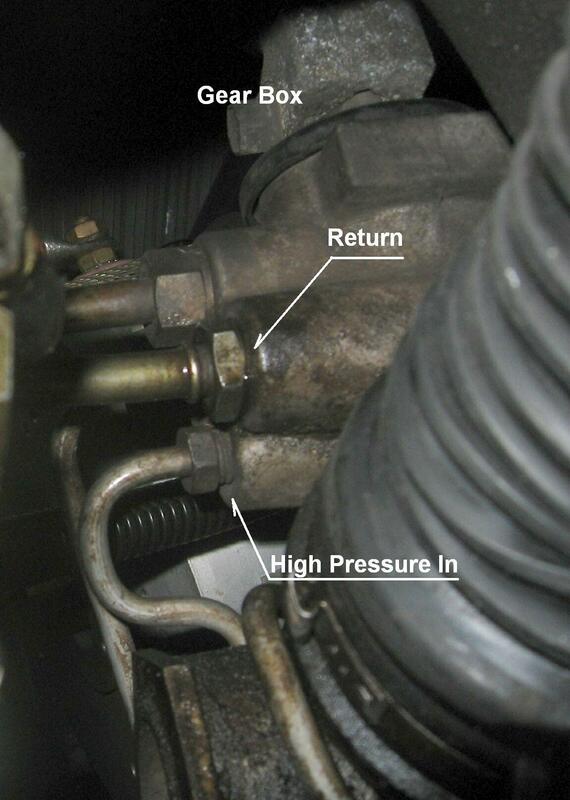 At the sane time as the piston advances, it produces pressure in front of the piston in the low pressure return line. 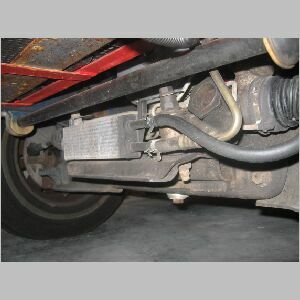 This combination of forcess opens the check valve and permits a reasonable level of unassisted steering control. Thanks to J.D. (James) Potter, John F. Ryder, Walter Sergeant, Dave Park, George Keramas and Ed Dygert for lending an ear and providing advice as I worked my way through the Hydraulics puzzle of power steering. 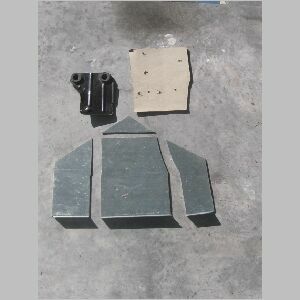 These are the parts used for the shunt, arranged as they will be assembled. The flow smbol is stamped on the valve. If you click on the picture, you can zoom in on the valve and its markings. The symbol on the right appears on the valve. If you click on the synbol you will see an expanation. 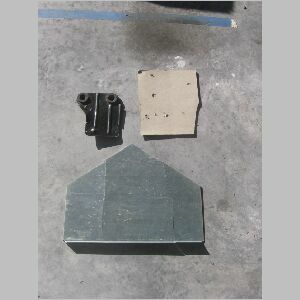 This is a Ford starter soolenoid from a 1965 to 1973 Mustang. 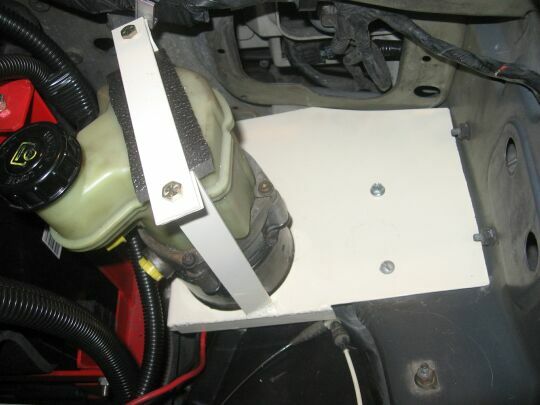 It will be operated by running the low current 12 volt positive wire through a switch on the dash.The high current terminals will carry the 12 volt positive to the pump. Update: This part failed in first few minutes of operation. Seee below. 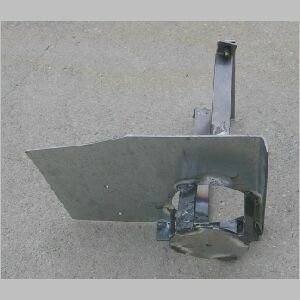 This shows the Solenoid mounted on the fender on a pice of aluminum angle. The pump has been refitted. 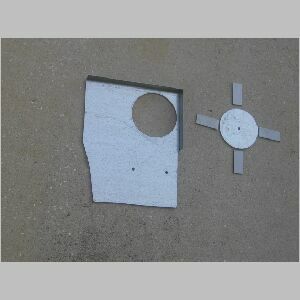 A quarter inch piece of white plastic (kitchen cutting board was placed under the steel plat for a bettere fit. 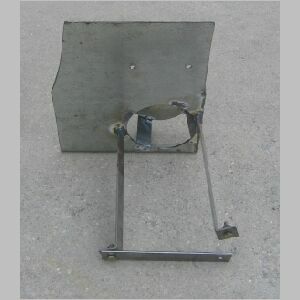 The top of the front hold down has had a corner cut off to aavoid hitting the witing harness. This is an over-siplified animation of how the fluid flows betweeen the gear box and the hydraulic cylinder as compared to the flow between the pump and the gear box. This animation ignores the proportional nature of the system and focuses on the direction of flow between the compoonents. 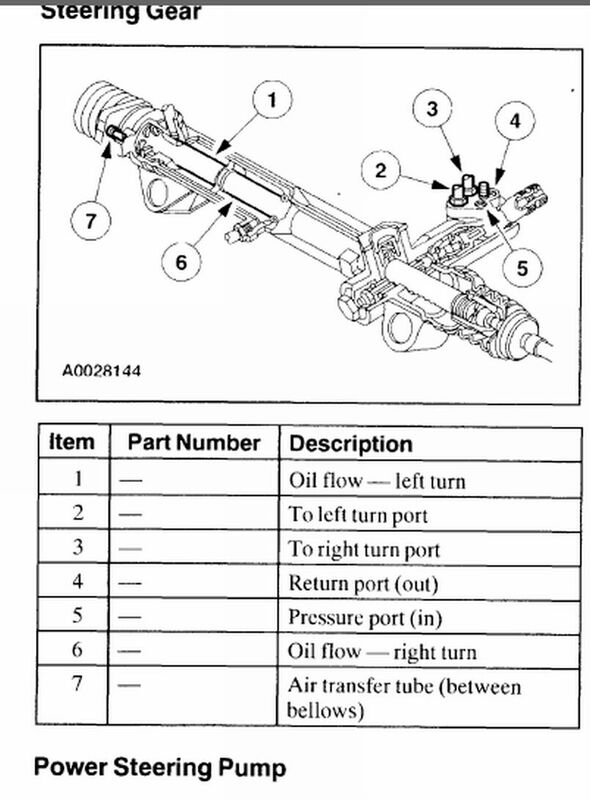 It is intended to show how the flow between the pump and the gear box is always in the same direction, while the flow in the hydraulic cylinder reverses, as you turn from right to left and back again. 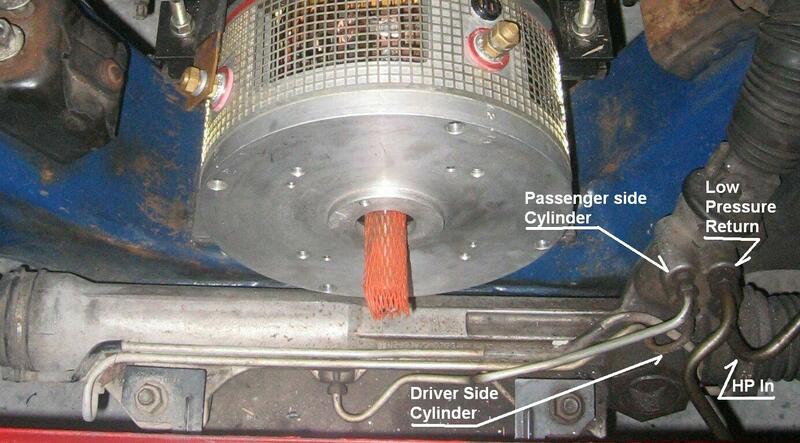 As the piston advances in the hydraulic cylinder, regardless of direction, and regardless of whether there is any asssist from the pump, fluid is forced out the return line to rhe reservoir in the pump. 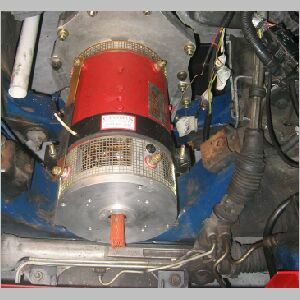 It is a function of the gear box to reverse the connection of the hydraulic cylinder lines to the pump when the piston changes direction. 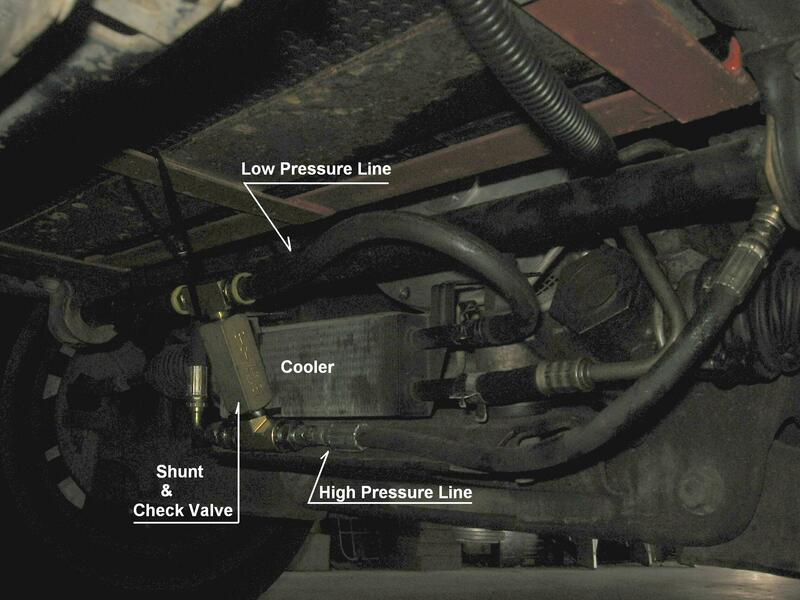 The purpose of the shunt is to allow fluid to flow, more easily, when the pump is off. When the pump is on the check valve in the shunt is closed. When the pump is off the low pressure in front of the advancing pistion opens the check valve. 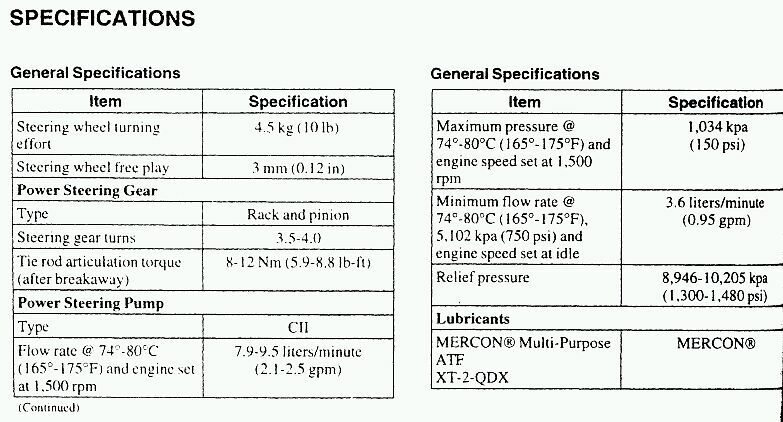 The check valve cracking pressure is 5 psi. What is important is that flow through the system is the same whether the pump is on or off. The gear box functions in the same manner. The advancing pistion always moves the fluid in front of it up the low pressure return line to the pump reservoir and, if the pump is off, draws fluid down the high pressure line through the check valve. When the pump is on and the check valve is closed, high presssure from the pump assists the advancing piston and the makes steering easier for the driver. You can click on the animation to see a largerview of the action. This shows the high current connections to the pump using AGW 6 copper wire. Yoou can see the fuse above right and the battery connection below. 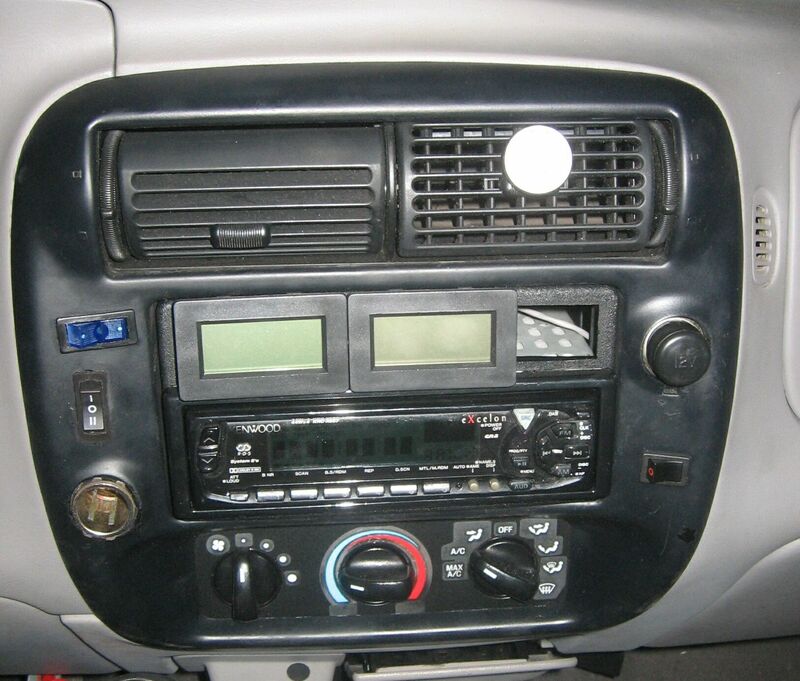 The low current wire from the dash sitch is yet to be installed. 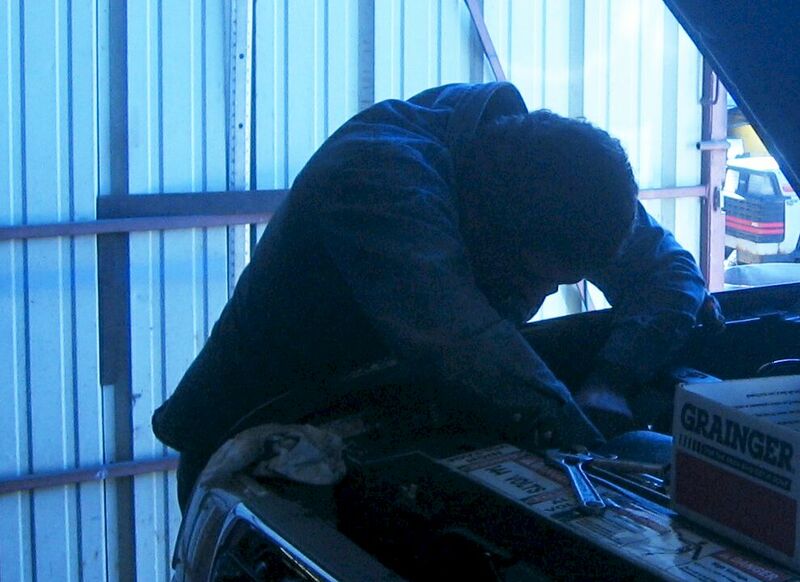 February 4, 2009: Ed extended the bottom line on the Drivers side of the gear box (the high pressure input) to the check valve and from there to the pump. Things went according to plan until it came time to connect the high pressure line to the pump. Although the thread looks lik a female 3/8 pipe thread, it is not. Mr Brown contacted a supplier on the phone and decided to bring the pump over there. In the mean time, I called Dave Park who told me it is most likely a UNC. 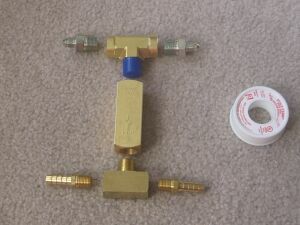 Mr Brown returned with all the necessary parts to make the connection to the pump. He said they only had one fitting with that thread. As luck would have, that was all we needed. Mr. Brown looks over the final hose connections. We tried the pump and no luck. It turned out my ground cable from the Anderson connector was loose. Ed put a new lug on the wire and sanded the paint off the chassis behind the screw holding it and we were in business. After adding some merciron we started to get some assist. 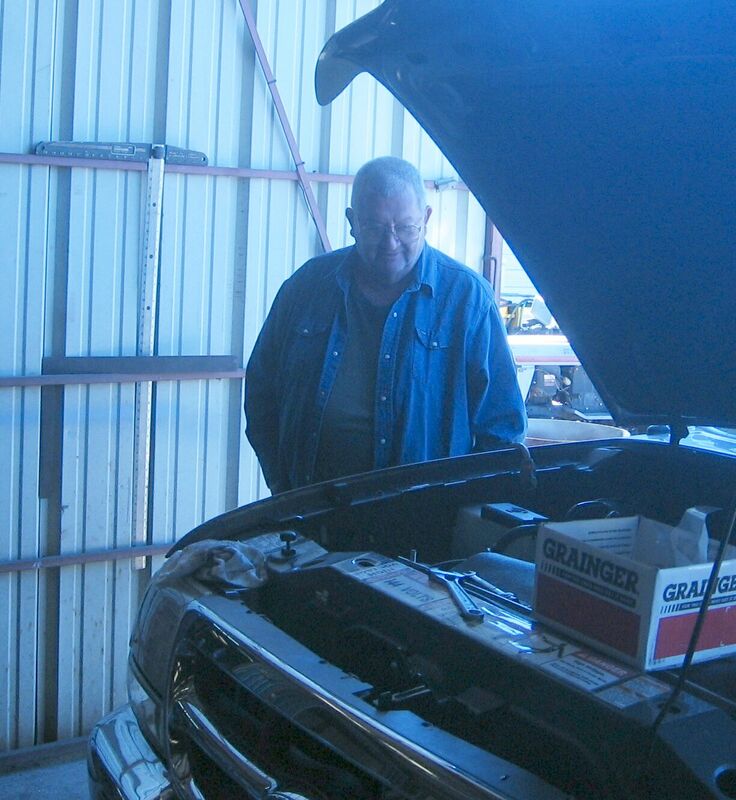 I paid Ed $302 for his days work and was on my way with the power steering working. When I arrived home, I couldn't hear the pump. After some diagnosic analysis I figured out the solenoid had failed. I discussed it with Dave Park and we decided I needed a continuous duty solenoid rather than the starter solenooid I had chosen. The good news is that on the drive home I never noticced the pump soleoid failure. I had complete steering contrrol through the failure. The fail safe part time power steering concept works well. I have the same level of steering control I had before the pump was installed when the pmp is off. There may be some slight advantage in having a pressureized system when the pump is off. The old system without the pump was not pressurized. I purchased an iluminated blue switch at AutoZone for $4.99 today. I will install this on the dash horazontally above the A/C switch shich is vertical. I also need to run the wire to the pump solenoid and replace the failed solenoid when the new Prestolite 15-139 Grounded 3 terminal, 12 volt, Continuous duty operation solenoid, at 100 amps arrives ($33.75 including shipping). 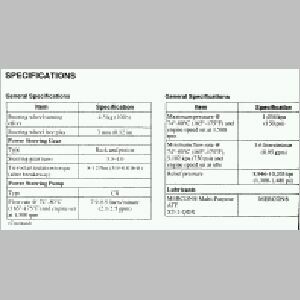 Hi-temp phenolic insulaton on all terminals. The inside job. Power steering switch upper left horizontal, powered from fuse #6 in the fuse panel at the end of the dash on the drivers side. Accessory battery DC-DC Coverter Hi/Lo switch (13.6v - 14.2v) lower right horizontal. Accessory Battery ammeter and volt meter over radio. Meters not finished yet. Still waiting for new solenoid. 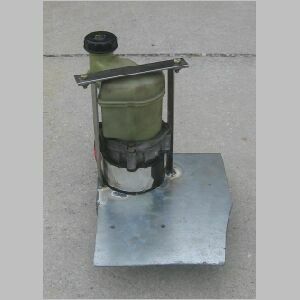 February 11, 2009: The replacement solenoid arrived. I installed it in a few minutes and took it for a test drive. Drove six miles with power steering on the whole time. added fluid to reservoir. On May 25th as I backed out of the driveway I noticed I had no power assist. After some pain and anguish I realized it could be just the fuse. I checked and sure enought the 40 amp fuse had blown. This pump draws 5-10amps when running and you don't turn the steering wheel at all, and when you turn the steering wheel draws 40-50amps. I was using a 40 amp fuse because it is the largest ATO/ATC fuse you can get. I have replaced the 40 amp fuse for now, but have ordered a Maxi Fuse holder so I can use a 50 amp fuse. From February 11th to May 25th, I had no problems. So I hope, just a little larger fuse will do the job. I have found that I was getting some shudder during turning. I followed the bleeding proceedure, jacking the front end and turning from lock to lock. I found over time that leaving the pump on full time eliminated this problem. Turning the pump on and off during driving seems to introduce air into the system. The check valve allows manual un-assisted steering with no damage to the pump. When the fuse blew, I was able to drive with no problem. Once I replaced the fuse the shudder was back. I had imagined turning the pump on and off while driving to conserve poower. This results in shudder during hard steering. I find the pump and other accessories cause the DC -DC converter to draw only 2.5 amps from the traction pack. This does not have a significant effect on range. So, in conclusion, I would say this is not part time, fail safe power steering, but rather full time, failsafe power steering. It may be that the check valve is unnecessary. But it does bypass the pump when the pump is off whether it is necessary or not.